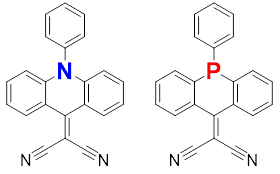 A series of the substituted two-electron acceptors with a dicyanomethylene-bridged acridophosphine scaffold has been prepared and compared with the nitrogen-containing counterpart using various spectroscopic, electrochemical and theoretical methods. In our recent collaborative study  an organic electron acceptor with a dicyanomethylene-bridged acridophosphine scaffold has been synthesized. Its properties has been compared with the N-containing counterpart. Additionally, the electronic properties of the P-containing molecule have been tuned by chemical modification, i.e. the corresponding phosphine sulfide, phosphine oxide, and a methylated compound (as a triflate salt) has been prepared. All P-containing compounds feature reversible two-electron electrochemical reductions and can be therefore potentially used for designing n-type semiconductors. The acceptor strength increase from N-containing molecule, to the parent P-containing species, and to modified P-contaning molecules as follows from both experimental measurements and theoretical calculations. IR spectroscopy showed that C≡N stretching vibrations have higher frequencies in P-containing species than in N-containing compound. It indicates that the C≡N bond strength is smaller in N-containing compounds due to more efficient electron donation to the dicyanomethylene group from nitrogen than from phosphorus. An additional twist is that the C≡N stretching band actually arises from two modes due to the vibrational coupling of the two cyano groups of the dicyanomethylene moiety. Theoretical calculations at the ωB97XD/def2-TZVP level showed that the high-energy and high-intensity mode corresponds to synchronous C≡N streching, while the low-energy and low-intensity mode to asynchronous C≡N streching. Due to the stronger donating properties of nitrogen, the splitting of two modes is larger in N-containing compound in comparison to P-containing species. Theoretical spectra correctly reproduced all trends in IR absorption energies and intensities. The heteroatom effect on UV/Vis absorption and fluorescence spectra is very strong. S1 band is blue-shifted and has much lower absorption intensity in P-containing compound compared to N-containing counterpart. 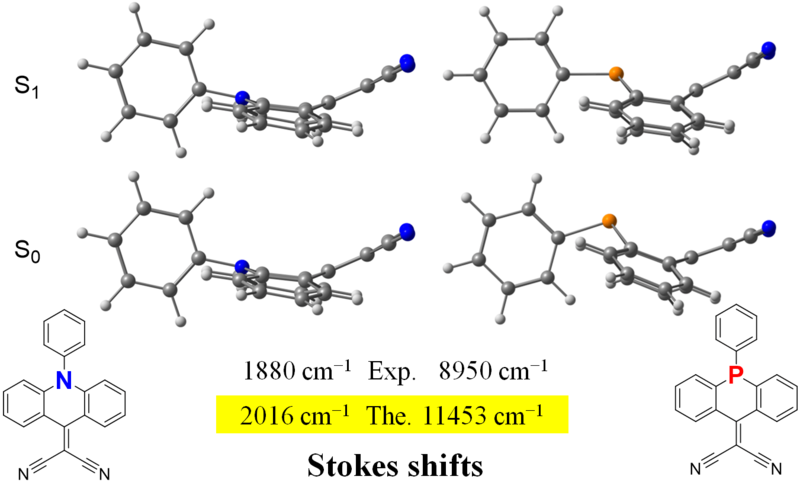 In addition, the Stokes shift is significantly larger in P-containing compound. We have used TD DFT to explain observed phenomena. Here the choice of an appropriate DFT functional is very important. The ‘default’ B3LYP functional provides seemingly good agreement with experiment in terms of relatively good matching between the experimental and theoretical position and shape of the absorption bands. Nevertheless it fails to describe qualitatively the aforementioned strong blue-shift, i.e. B3LYP fails to describe the heteroatom effect on S1 transition. It corresponds to HOMO → LUMO transition, where HOMO is localized on acridophosphine scaffold, while LUMO mostly on the dicyanomethylene moiety. S1 transition correspond therefore to the intramolecular charge transfer (ICT). This transition is qualitatively properly described by range-separated functionals ωB97XD, CAM-B3LYP, and LC-BLYP, which however suffer from systematic overestimation (common for these functionals) of transition energies. Since these functionals qualitatively properly described heteroatom effect on S1 transition, we have used one of them (ωB97XD) for all the analysis including conclusions about ICT nature of S1 transition mentioned above. The heteroatom effect on the Stokes shift is also perfectly explained by ωB97XD/def2-TZVP. The large Stokes shift in the P-contaning molecule is explained by strong change in its geometry upon excitation — the molecule around heteroatom become more planar. In contrast, the geometry of the N-containing molecule does not change much. 1. Tobias A. Schaub, Steffen M. Brülls, Pavlo O. Dral, Frank Hampel, Harald Maid, Milan Kivala, Organic Electron Acceptors Comprising a Dicyanomethylene-Bridged Acridophosphine Scaffold: The Impact of the Heteroatom. Chem. Eur. J. 2017, 23, 6988–6992. DOI: 10.1002/chem.201701412. How Valid Is the NDDO Approximation?